The development of the TIGER HAD Mark II standard has been launched by OCCAR on behalf of France with the signature of the relevant contracts between OCCAR, Airbus Helicopters TIGER and TDA Armements on 15 December 2016. A major milestone of the TIGER HAD project was achieved on 13 December 2016 with the delivery of the first TIGER HAD/E in Block 2 configuration to the Spanish Army. Three further helicopters will be delivered before the end of the year. Operational premiere: On 12 April, a French TIGER HAP helicopter of the 5th Combat Helicopter Regiment was transferred in an A400M from Gao (Mali) back to its home base in Pau (France). The complete helicopter transport was performed within 24 hours, including a stop in Niamey (Niger). 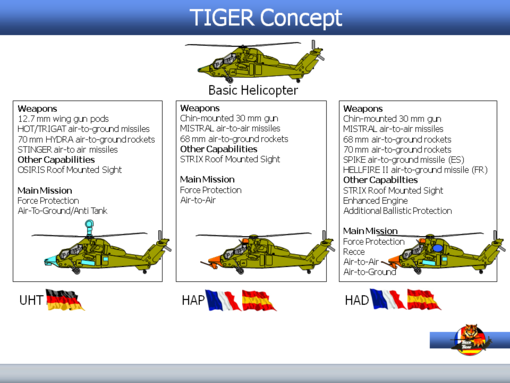 A major milestone in the TIGER Programme was achieved on the 18 December 2014 with the delivery of the first two HAD/E helicopters to Spain during a ceremony involving the Spanish TIGER Programme Committee representative General Roberto Soria Martínez. In the frame of the TIGER Helicopter Programme, OCCAR-EA has awarded a contract to ARGE TATM, a partnership composed of Thales Training and Simulation (TTS) and Rheinmetall Defence Electronics (RDE), for the upgrade and the In-Service Support (ISS) of the TIGER Aircrew Training Means (TATM).